I took these pictures as I passed through Manchester Victoria station today. Some might think, that we spend more time and effort on getting the heritage details perfect, than we do on improving the experience for passengers. My only hope is that if this space gets used as a restaurant, then it gets one with a bit of quality. Where Is The Todmorden Curve When You Need It? In my view, one of the biggest sins in good project management is to do jobs in the incorrect sequence. In recent months, two important projects have been scheduled in the north of Lancashire. The Todmoden Curve is a short stretch of railway that will improve train services between Burnley and Blackburn to Manchester Victoria, by way of Todmorden and Rochdale. The first train ran in May 2014 and from May 16th this year, there will be a full service. The Farnworth Tunnel has to be enlarged for electrification and it means that for the next few months, the direct route from Preston to Manchester will be very much reduced in capacity. Work on this will start soon and the new reduced service kicked in today. At Preston on Friday, I asked if there would be a normal Blackburn Manchester service by the Ribble Valley Line. I was told yes and on reading the handouts from Virgin, there was no mention of any diversions or altered services. But when I arrived at Blackburn station, I was told there was a bus to Salford Crescent, from where I could get a train to Manchester Piccadilly. The bus took nearly ninety minutes and then I had to wait another twenty to get a train to Manchester Victoria, from where I got a tram to Piccadilly. There I got a train to Euston, which although it did go by a roundabout route because of engineering works, brought me safely to London. It would have been so much easier to get from Blackburn to Manchester if the services by the Todmorden Curve were started before the partial closure of the Farnworth route. The fact that the curve wasn’t opened before work on the tunnel started was a disgrace and it unnecessarily inconvenienced lots of passengers. For the last match of the normal season, in some ways this was a bit of a disappointment, as Ipswich only needed a point to be certain of the play-offs. 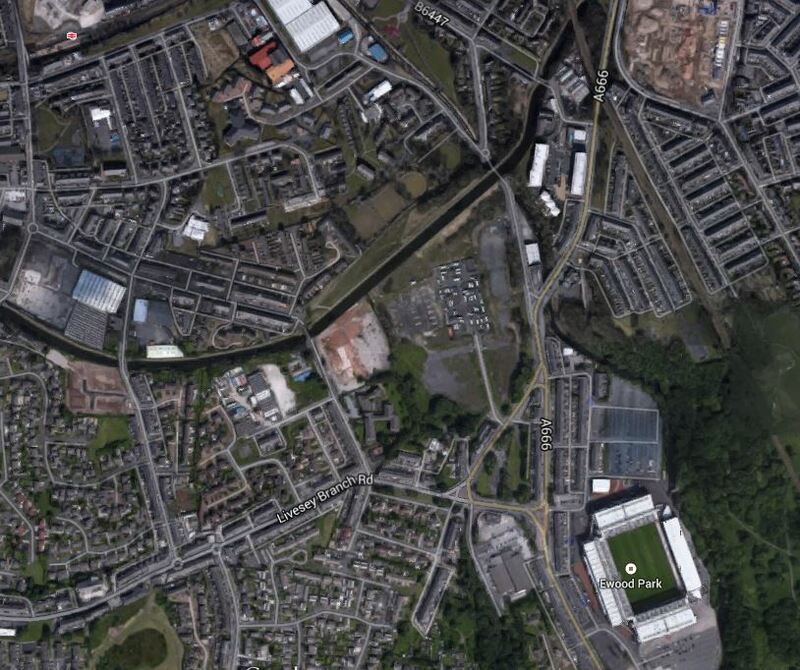 Ewood Park, the home of Blackburn Rovers is not the easiest ground to get to from the main station for the town. Normally, I take a bus from the station, but it is not the easiest way as there is no relevant information, despite the fact that the bus station is outside the train one. Obviously, the natives are psychic in Blackburn. So today, I decided to go via Mill Hill station as it looked like a downhill walk to the ground. This Google Earth image shows the area. Mill Hill station is in the top left of the picture and the football ground is to the bottom right. These are some pictures of the station. I didn’t post any of the maps and signposts at the station, as there isn’t any meaningful information on how to get to the football ground. I don’t think I’ll bother with this route again, as it has little to recommend it and a station that desperately needs more information and disabled access. It is a truly dreadful station and after the Todmorden Curve is fully open, you’ll need to change trains at Blackburn to get here from Manchester. I didn’t take the direct route from Preston to Blackburn, but decided to explore the East Lancashire Line that stretches from Blackpool on the coast to Colne deep in the hills. It is one of those rural lines, that has a lot of the flavour of the Valley Lines in South Wales. Trains are elderly, but well-turned out Class 142 and Class 150 trains, running between a series of stations, many of which have been recently upgraded. 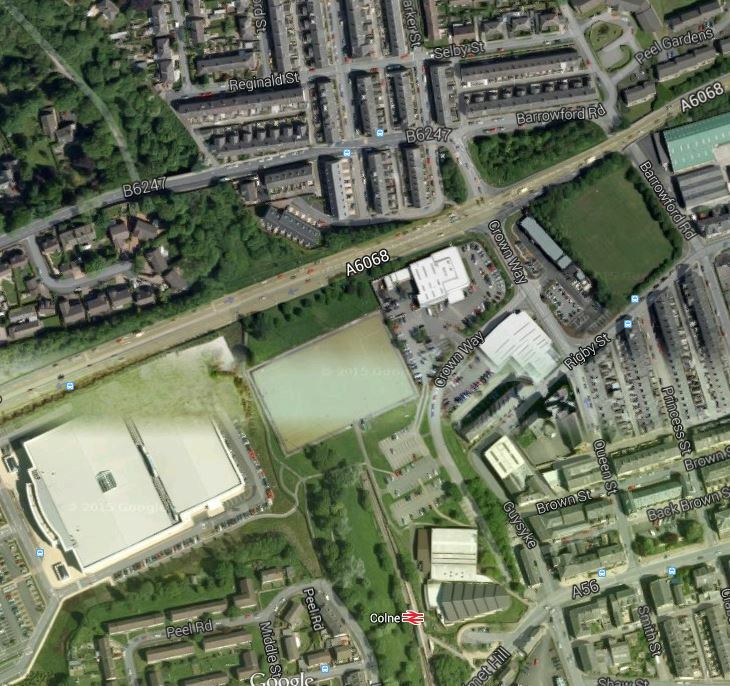 To get a better feel of the Burnley area, this is a Google Earth image of the centre of Burnley. The two stations; Central and Barracks lie on the rail line that goes across the top-left corner of the image. For most of that way, the line is on a viaduct with a station at each end. Turf Moor, the home of Burnley FC is at the far right of the map. The East Lancashire Line is very much down the list of electrification priorities, but as it has interchanges at Preston, Blackpool and Rose Grove, that are electrified or will be in a few years, the costs of electrification will be eased by the supplying of power being already there. Some work needs to be done on the stations, but a lot is informational like the signage and local maps at Mill Hill. Some like Mill Hill and perhaps others, need improvement to their disabled access. There is pressure to extend the line past Colne to Skipton. and it is description under South East Lancashire Rail Action Partnership. The Wikipedia article says this about the link. The missing section of railway between Skipton and Colne is 11.5 miles in length; it was closed in January 1970 although it was not a target under the Beeching Axe. Dr. Beeching is a hot topic, but when he said a railway shouldn’t be closed, history has in some cases like the Varsity Line, shown him to be right. At least with Colne to Skipton, the trackbed hasn’t been built on. Having seen tram-trains working successfully in Germany and France, I think that if the Class 399 trains prove successful in their trials between Sheffield and Rotherham, that vehicles like this may offer a cost effective way of linking between two electrified lines. Skipton station is electrified, but Colne is not. However from Rose Grove to Preston and on to Blackpool is planned to be completely electrified in the next few years. So as Burnley Barracks and Central, Brierfield, Nelson and Colne will effectively be on a single line branch from Rose Grove could it be electrified to perhaps only a tramway standard with occasional passing places and extended to Skipton? Intriguingly, at the other end of the line at Blackpool South the trains could then transfer to the Blackpool tram system. It may sound all rather fanciful, but it might be easier to slot a tram track through Colne, rather than build a new railway, especially as this Google Earth image of Colne station, shows that there is the dual-carriageway A6068 and a football pitch in the way. It would surely be cheaper to cross the main road with a tram rather than a railway track. Surely another advantage of using tram technology is that it will be easier to add extra stops on the line. I do think that this neglected line from Blackpool South to Colne via Preston has scope for improvement. Judging by some of the ideas in various forums on the Internet, there are a lot of ideas that get proposed by politicians, rail professionals, enthusiasts and train users. Three things though are going to help decide what happens to this line. If the incoming government does what is threatened at the present time and electrifies the Calder Valley Line from Preston to Leeds via Blackburn and Burnley, there will likely be a sound economic case for electrifying from Blackpool South to Preston and from Rose Grove to Colne, as both lines are mainly single track. Electrification will also make sound sense, as there will be more than a few electric trains available, as Crossrail and Thameslink are getting new trains and the displaced trains will be cheaper to refurbish than build new diesels. I believe tram-trains will be a success and that these could prove ideal to extend the Blackpool tramway. Incidentally, I’ve found a report on the Sintropher website, which details how the Blackpool tramway will be made compatible with tram-trains.